*If I had a dollar for every time I heard the word “mom” today…I’m pretty sure super confident that I would be rolling around in a giant pile of bills, devising wonderful ways to spend my millions of dollars. *What’s more, is that when I decided to go get the car washed, by myself, apparently I had not spent nearly enough time with the (homeschooled!) child that was the repeat “Mom” offender, so said child grasped my legs, hugged me, used the ‘m’ word again, repeatedly, and begged to join me. Obviously. *Same child continued to have meltdowns all evening. Bedtime was a beautiful thing. Bless it. *I adore my kiddos. Please don’t misunderstand. *Apparently, I need to buy groceries. Not much dinner is made from ground beef and sweet potatoes. *I’ve made it one whole day, grain and sugar-free. I won’t bore you, but I need to do this more than just today. One day is a huge leap in the progress department, though. Food is my Kryptonite. BREAD is life. *I’m still reeling from the fact that last night, the breath was nearly knocked clean out of my chest, when my oldest decided to ask awkward questions, point-blank, just before bedtime. Fun times. I thought I was prepared. I wasn’t. I don’t think she observed my weakness, though. Thankfully. I peeled myself off of the floor with as much grace as I could muster, and applied the “fake it ’til you make it” mentality. Luckily, I had this book on hand and put it to good use, along with this one, put out by American Girl, which we actually have never purchased a single other item from, because my husband would undoubtedly keel over with one look at the price tag. Since I utterly and completely love my husband, I’ve decided to do my part in helping him to not keel over anytime soon. But I digress. Awkward conversations were had. Questions were asked. Questions were mostly answered. We survived. End of story. *Today, I chatted with one of my dear friends about plans. About how I love to plan my life. About how God is moving me, wrecking my heart and drawing me out of my comfort zone. About how He is basically, in the most gracious way possible, rearranging my plans and stirring conviction. About how its okay. 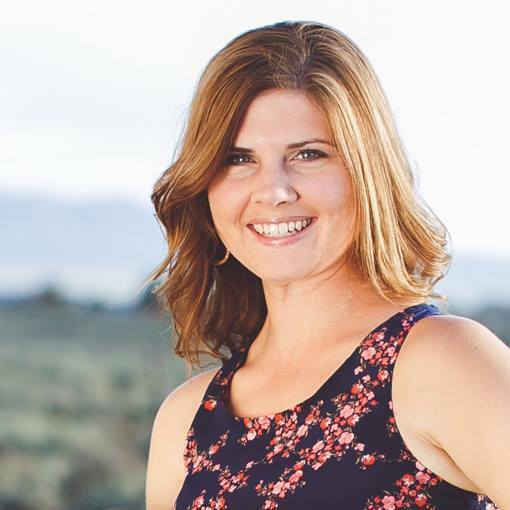 About how in the midst of my own heart being rearranged, I stumbled across Falling Free, by Shannan Martin (this book was the first I had heard of her, but now I stalk her blog). I devoured it. Go read it. *In case you were wondering, beware of haphazardly clicking related videos on YouTube. It starts off innocently enough. You curiously click an intriguing link. One click here, another there, and before you know it, the Matrix is real, and our world is ending in 27 1/2 days, but not before an alien race, led by the government, takes over the planet. I know nothing of this, personally, but I’ve heard things…beware of clicking through the rabbit hole. Monday. It’s nearing an end, but it will come back around quickly. Have an incredible week! I sat, scrubbing away the mud from the soles of my 5 year old’s bare feet. He giggled when it tickled and I felt my heart soften. Just 20 minutes before, I was frustrated beyond measure, as I left church early, with three kids in tow. On the way through the parking lot, the 5 year old and I both slipped in a mud puddle, caking our sandal feet in nasty, parking lot mud. I remember thinking, “You MUST be kidding!” We continued our trek home, me frustrated, and him cranky, both of us with muddy feet. Oh, I was frustrated well before the mud incident. It had been one of THOSE mornings, to which I’m sure others can relate. All three kids were in a state of rebellion (each in their own way), hearts turned against my instruction, and my heart was growing harder as the morning wore on. This momma stuff can be hard. It can be pretty muddy. I was struck, though, as I was kneeling before my 5 year old, cleaning his feet. I couldn’t help but think of Jesus as he washed his disciples’ dirty, worn feet (John 13). He knelt before Peter, the one that would deny their relationship in the coming days. He washed the filth from Judas’ feet, knowing that Judas had already quietly betrayed him, soon to be brought in the open. His hands cleaned the feet of Thomas, whose heart would doubt in the coming days and weeks. Jesus knelt before each imperfect disciple, touching their dirty feet, in an act of service that was far more than just cleaning dirt from the feet of these men. In that humble act, he was turning hearts. Humbly, he loves us, beckoning us to humbly serve and love, in His name. Even in our service to our children. Sometimes our service looks like literally cleaning the mud from the feet of our child. Sometimes it looks like giving space, difficult teacher/parent conferences, cleaning up spills, bandaging hearts, taming tantrums, stitching relationships back together, asking for forgiveness, standing with them, loving and serving them when it is hard. It may look difficult, messy and unpleasant. We choose to get our hands dirty, for the sake of their precious hearts. Sometimes, it will seem that we are serving the hardest of hearts. Sometimes it may feel as if we cannot kneel any longer. Sometimes, it may feel like a hopeless endeavor. Sometimes, our hearts are the ones changing. We can tell of grace, when we give it. We can speak of humility, when we are on our knees. We can share the love of Jesus, when we allow His love to be an extension of us. In our culture of self-sustainability, self-help, and self-care, this sounds preposterous. “Stop taking care of yourself.” Walk into any bookstore and you’ll immediately find an array of self-help books. Scroll through Pinterest for a variety of betterment ideas. Glance at Instagram for a lot of post-workout selfies and green smoothie photos. You get the idea. We are surrounded with a myriad of ways to care for ourselves. Which is exactly why the title of this post seems so aggressive and anti-YOU. But its not. Read on, friends. A few months back, I had the privilege of attending a wonderful conference with my husband. Kid-free. Hotel. Enjoyable conference. Refreshment. Rest. <insert abrupt, screeching record sound here> Wait, did I say rest? Right. Well, I anticipated rest. The first night was wrought with the strangeness of a hotel room with an extra bed we didn’t need, a bit of anxiety, and so on. I didn’t sleep. The following day was busy. Conference. Wal-Mart, late night arrival back at the hotel. Ahhhh. Now, we could rest. Right. Did I say rest, again? The second night was complete with a shaking room (seriously, still have no clue), intoxicated hotel guests talking loudly in the halls, and so on. We weren’t at some dumpy motel either. My husband made sure we were at a nice, safe, reputable hotel. So, cue second night of no sleep, and a desperate, more than usual, need for coffee the following morning. My go-to Starbucks beverage has always been a Vanilla Latte. I loved it in high school, and I love it now (though I take far less syrup in it now!). Unfortunately, in my old age (read: 31), apparently my stomach can’t handle fancy coffee drinks anymore, but that morning I NEEDED a good strong coffee with extra espresso and the whole nine yards, so I splurged. It was worth the uncomfortable tummy effects, and it was awesome…until I spilled it on the floor under my chair at the conference, before I had the chance to enjoy even half of it. I can’t make this stuff up. Don’t cry over spilled coffee. My life could be a sitcom most days. I survived, but here is where it gets good (i.e., where God wrecked shop in my heart…). There was a resounding theme that day and I continued to be encouraged through scripture and song, reminding me of the rest found in Jesus. I was struck with the realization that I often try so hard to take the care of myself, upon myself, that I end up exhausting myself through my efforts. Do you follow? In my efforts to find rest, I was using up more energy and heaping more burden upon myself. Oh, the irony. In that moment, that day, I was forced to look past my exhaustion, and find soul refreshment in God. I had no choice in the face of complete exhaustion. I was overwhelmed, honestly, with the realization that I had been taking care of myself for so long, and not allowing myself to be cared for by the mighty creator of this world. The creator of my soul. MY creator. I was reminded of Psalm 23. Because of what HE does, my cup overflows. Not like an overflowing plate of STUFF that is burdensome…no. An overflowing cup. Like a creamy vanilla latte (or whatever you prefer in your mug) that doesn’t empty out on the floor or cause tummy trouble. Starbucks doesn’t hold a candle to this cup. Friends, this cup is GOOD, because our Father is GOOD! A shepherd guides his sheep, not the other way around. I don’t find rest because I chase it down, but because He leads me there. The path I think looks peaceful, may actually be steep and strenuous. I don’t have to exhaust myself, running from place to place, seeking rest. I seek Him, and He provides what I need. I don’t know about you, but I like the sound of that. 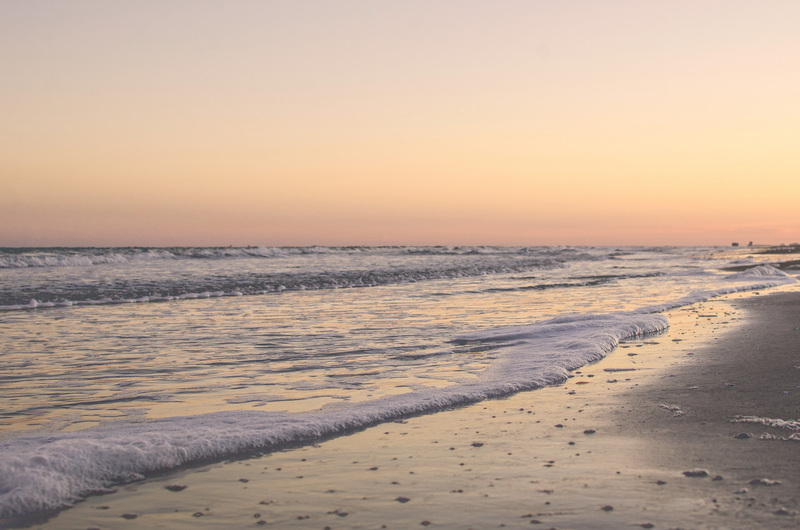 So, while I don’t condemn “taking care of yourself” in practical ways, or drifting off to sleep when your body needs physical rest, I challenge you to find your soul’s rest in Jesus. By all means, go get that pedicure and nap when the baby does! Remember, though, that you, my friend, were created to need physical re-charge, as well as emotional, mental, and spiritual refreshment. Let us not forsake the latter. This seems to be a common exchange among people of all ages lately. I don’t know when I began to take notice, but perhaps it was when I noticed myself saying it more and more. It seems to be a go-to answer, especially when you don’t have authentic relationship with the person asking. It nearly seems like a justification for having no time for relationship with the person you are talking with. Am I right? Busyness can be a curse. Busyness can certainly be, and is often, a curse, rather than a blessing. We are apt to say things like, “Oh, we are busy, but it is with all GOOD things!”, “Busy, but I like to keep moving!”, or “Busy, but too blessed to be stressed!”. We are pulled in many different directions, being stretched far too thin. I imagine a rubber band that is being slowly stretched. The center point, the breaking point, slowly thinning, at risk of snapping at any moment…yet, we continue to allow the stretch and pull, until we cannot withstand the pressure any longer. I can only imagine the immense satisfaction that Satan feels when the followers of Jesus are busy and stressed. In our busyness, we often miss our own brokenness, and brokenness is where grace shows up. Remember when Jesus illustrated salvation with the picture of being born again (John 3)? Being born again suggests a new growth cycle. We are growing new; starting over, with the process of growing spiritually more mature, and changing with each stage of growth, just as we do in our physical growth process. We recognize our brokenness, then grace, by the name of Jesus, steps in and propels us to growth, beyond our broken nature. Furthermore, scripture tells us that we, as fellow Believers, are an integral part of each others’ growth process! When we experience grace, we are then free to give it and show others the joy of walking in it.We receive. We give. We walk it out. It is part of our growth process. So, then, what happens if we are too busy to meet together or encourage one another? What happens when we are too busy to share in our brokenness and walk out the gift of grace together? We can become apathetic and complacent, stagnant in our growth as a Believer. In our busyness, we often miss authentic community, and community is where we walk in grace. I don’t believe that the author of Hebrews was talking about meeting only on Sunday for Sunday School and a sermon. In the book of Acts, the author wrote that the early church met together daily, in each others’ homes! Now, don’t run away just yet. I see you there, wide-eyed, at the mention of the word “daily”. Stay with me for a moment. Think about the concept for just a second. Opening your home. Others opening their homes. Building community, growing relationships, being vulnerable, and making time. It speaks more to me for someone to make the time, than for them to write a check, and I think we could all agree. For most people, money is more disposable than their time. So, if our time is of value, then what does it say to those around us when we don’t make the time for them? Does is speak to how we view the people around us? Do we view them as valuable and worthy of “spending” time on? Think about it. Perhaps, we should evaluate our currency; our time, and how it is spent. We can DO a lot of GOOD things and still be missing out on the beautiful community that is all around us. When we busy ourselves to the point of exhaustion and leave no room for authentic relationships with people, we have busied ourselves right out of God’s design for us. Now, this is a hard post to write, because I’ve been in the same boat. I’m stretched thin, just like the rubber band, and yet I often don’t know how to end the constant “stretch, pull, break, start again” cycle. I’m working on it, though. I don’t want to look back in 20 years and wonder where my time went and what sort of things I spent it on. I want my greatest currency, my time, to be spent on things of substance and value. We can start small and grow, but the point is that we need to start. Start with meeting a friend for lunch one day a week. Start with having the crockpot filled with food on Sunday so that you are free to invite another family over for lunch. Start with something. It will be worth it. Will you join me in building community, one block of time at a time? *I’d love to hear from you! Comment and let me know how you plan to better spend your time, and build community into your life. Let’s encourage one another and share! My youngest son and I walked hand in hand, into the church for the Wednesday night kids’ program. He was tired from a long day and just hanging on by a thread. It’s tough to be 4, sometimes. It’s even tougher when you have an expectation and things don’t go as planned. (Don’t we know it!) An unplanned (minor) hiccup in his evening caused a colossal meltdown, and if you have been around children, you’ll know the meltdown I’m talking about. TEARS. Oh, the tears. Buried face in my shirt. “I just want YOU, mommy.” Kids pouring in from all directions. Noise. Stares. Suddenly I’m surrounded by a group of 4 and 5 year old kids. “Is Levi okay?” “Levi, what’s wrong?” Wide eyed with concern, their faces were sweet and caring. No judgment. Not wondering why this kid was having a meltdown over something that was seemingly insignificant. Just care and concern. Just community. Community. It can be such a beautiful and rewarding part of our lives. We desire it. We crave it! I think that there are three important things that we can grow and learn from the Pre-K community. 1. Community takes effort and sacrifice. Just before we left for church that evening, my sweet, tired boy was lying on the couch, watching his favorite show. Shoes kicked off, relaxing, just being 4. At the first mention of getting shoes on and going to church, his response was that he wanted to finish his show…and he didn’t want to put his shoes on (me either, kid). I casually mentioned a few friends’ names and let him know that if he wanted to see them, he would need to put on his shoes so that we could leave. He perked up, said, “Oh! I want to see my friends!”, put on his shoes and turned off the show. For him, that was sacrifice. It took effort and a made up mind to do the things he didn’t feel like doing so that he could go to church and visit with his little tribe of Pre-K friends. For us grown-ups, this might look like allowing others into our homes, carving out time for coffee with a friend, or leaving the house, even when we don’t feel like it. Community may require some sacrifice and certainly some effort, but don’t doubt that it will be worth it. 2. Community is beautiful when judgment is withheld. Community can be messy, when we meet each other in our weaknesses, not just our strengths. As I observed the wide eyed, pudgy cheeked faces peering at their friend in distress, I was struck with the genuine concern that I saw. There was no judgment for their friend that was causing a scene and struggling. There was only love. There were no sideways glances or rolled eyes. You know, any one of those sweet little faces may have been tear streaked just hours before when their day did not go as expected. They saw a friend in need, and they responded with love. For us, this will certainly mean that we reserve judgment and see the person, beyond a situation at hand. We may not always agree or have the same situational response as another person, but we can still love the soul of who they are and extend grace. 3. Community refreshes our souls. When we left that evening, my son was all smiles. He had pushed through the “don’t wanna”s, been refined and encouraged, and ultimately experienced soul refreshment. It is GOOD to be involved in a community that supports, encourages, and cares. We were created for community, and we will be lacking without it. Shout out to the 4 and 5 year old cuties, for the sweet and genuine display of community that I was honored to witness. We could all learn a few things from observing the pint-sized community of children, especially those that are young enough to not be tainted by the silly, presumptuous notions of grown-ups. Perhaps we should all be a bit more childlike in our care of others. Some are still reeling from grief, a gaping wound, fresh on their heart. The year has held joy for those who have welcomed new life or experienced life anew. Some have traveled the world, and many have basked in the retreat of their home. Some hearts have journeyed to places that they could never have imagined, and some to places where they never wanted to imagine. We have all been somewhere. This year, we did not spin our wheels to nowhere. These are trails, not destinations. We are still on our way, just passing through. There have been friendships lost, and friendships gained. Warm embraces, cold shoulders, loyalties defended, and relationships offended. We have risen, fallen, and stood up again. We have been weary, and we have been renewed. Like the tale of Hansel and Gretel, we have left breadcrumbs behind, telling of our journey, and along the way, we have distinctive markers that now define us. Markers that define our faith. Carved into a tree, roots planted deep, or etched into stone, irremovable. The Israelis, in the book of Joshua, were instructed to gather stones, in order to build a memorial, as a reminder of what God had done. You see, He moved water for them. As in, stopped a river from flowing, so that they could cross on dry land. They were continuing on their journey, but this was a significant part; one leg of the trip that was worth remembering. It is all worth remembering, but some places deserve special recognition. In that moment, it is worth celebrating or acknowledging, but even more so, in the days to come. Looking back on the markers that define our faith, we see God’s provision, faithfulness, patience, grace, and more. As we enter a new year, we will undoubtedly be journeying toward times of joy, sorrow, excitement, confusion, faith, doubt, and more. As we enter those times, we can reflect upon markers that we have erected in the past. In times of doubt, we will remember when our faith was restored. In times of sorrow, we will recall when our Lord sustained us. In times of darkness, we will rest in the promise of His light. In times of weakness, we will reflect on His strength. In times of joy, we are thankful to our Father, forever the giver of all good things. In times of grace, we will remember the journey. In ordinary times, we will worship and remember. Let there be markers that define our faith. Let us not forget. Let us pick up stones and etch into trees, build memorials, remember, and tell what the Lord has done for us. I want to be difference maker. I know you do too. As we navigate through this maze of life, with a passion for the Gospel of Jesus, we must tread with the strength and courage of a lion, while exhibiting grace and peace, like that of a lamb. We will require strength as we walk head on into places where the name of Jesus is trampled on, and we courageously say, “That is MY God.” We will certainly need the extra grace, as we encounter the broken who reject Christ, because they do not understand authentic love. Sadly, we often leave the lamb behind and charge forward with a roar. We feel compelled to speak up, yet when we do so, we often leave no room for peace. Paul tells us in Romans (12:1), “If possible, on your part, live at peace with everyone.” But, what does that look like for us, who are anxious to make a difference in the conflicted world around us? Standing strong on the Gospel of Jesus does not mean we approach the debate podium with every opportunity that we are given. The Gospel of Jesus does not bid us to fight a fleshly battle, only to come away, both parties bruised and battered, yet no better for it. The way of Jesus does not lead us to be “right” or to bring down the gavel of condemnation. Often, the way of our Savior calls us to wisely walk past our side of the debate, to bring a glass of water to the opposing party. Often, we would be better off shredding our notes and lifting our eyes to see past the offending topic, and into the eyes of the person that Jesus loves. Then, and only then, can we truly be the hands and feet of Jesus. When we read about the ministry of Jesus, we see him stoop down to look into the eyes of a prostitute, dine with a despised and corrupt tax-collector, answer the questions of a doubting religious leader, and the list goes on.This was His avenue for bringing light. Instead of telling the world that it is dark, we can be the defining light. We can be the hands and feet of Jesus. Our votes, our signs waved high, and our social media posts won’t do that. It all comes together under a banner of grace and love, only found through hearts turned heavenward, seeking to pull the scorched, aching hearts of this world, under the cool umbrella of Christ. We don’t dare neglect our commission to share the good news, but we press into the hearts of people to do so. We proudly bear the name of Jesus, but we do so with gentleness and respect. 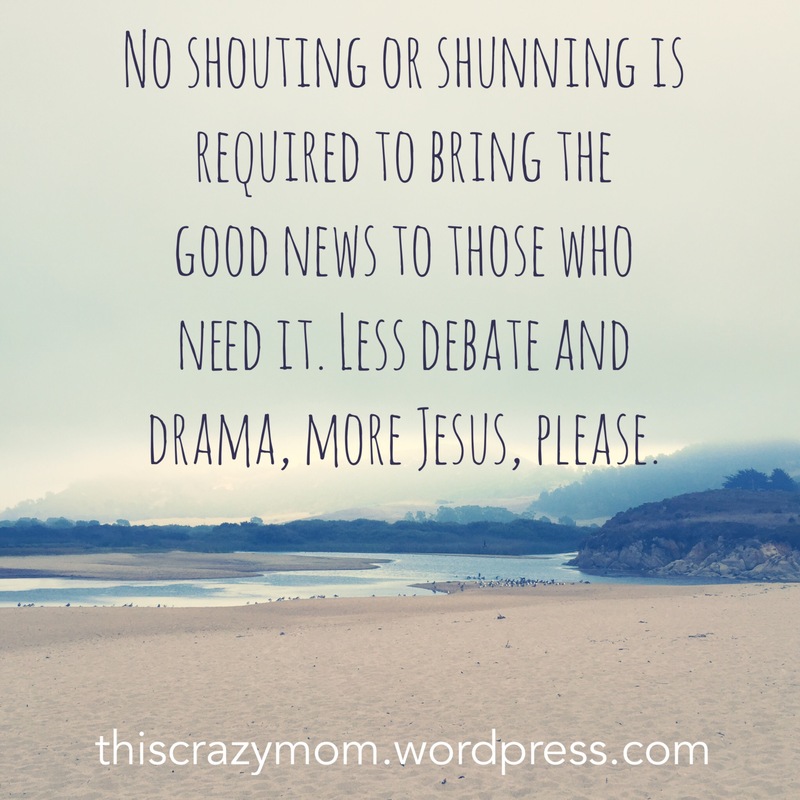 No shouting or shunning is required to bring the good news to those who need it. Less debate and drama, more Jesus, please. To live at peace with those around us may require a heaping dose of humility and hearts surrendered. Our battle is not against flesh and blood, but it goes far deeper, beyond the reaches of this world (Eph. 6). Friends, let’s lay down our signs, and extend a hand. We can be firm in our convictions, without scarring people in the process. Seek out wisdom from above, gentleness and peace, and I believe you will be a difference maker. This morning, I dropped all three of my babies (don’t tell them I called them that!) off at school…and left. I left their minds and hearts in the care of three amazing teachers, but more importantly, I left their minds and hearts in the hands of Jesus. We home schooled last year, and at the time it truly was best for our family. Refocus. Yes. We needed to refocus and slow down, taking in each day, in close stride with one another. It was good for us. I love home school, and I have deep admiration for home school families. Even more so, I admire families that follow their convictions, and are at peace with the decisions that they make for themselves. Peace. Being at peace with your decisions, no matter what they are, is so important. Whoa. Friends, that is not what peace looks like. If peace is like a river, my heart and mind were a raging sea. Ah, yes. Pray. I was so busy thinking and worrying, that I failed to take my worries to Him, who knows no worry. Him, whose peace surpasses my own anxious thoughts. Him, who will fiercely guard my heart and mind in Christ Jesus, when all I must do is ask. After prayer and open discussion with my gracious husband, we both felt at peace with our decision to make a change for our family. Knowing that last year’s decision was still good and right for us then, we both felt a burden lifted when we were at peace with making changes for THIS season of our lives. So many factors were considered during this ongoing discussion and time of seeking the Lord, but that is beside the point. The factors don’t even matter now, and I write not to defend our family’s choice, but instead to proclaim that walking in peace is better. Better than guilt, worry or fear. I was able to leave this morning, knowing that this was a God-honoring decision for our family. Peace comes when you rely on God, and relying on God is always better. Peace is better. “You will keep in perfect peace the mind [that is] dependent [on You], for it is trusting in You. What sweet freedom we have when we walk in the grace that is offered. Grace from above has no expectations. Oh, what we can do for His kingdom when we trust in Him, walking in freedom and peace! I don’t know where you are lacking peace in your life, but be encouraged. Freedom = peace, and freedom comes from above, by the grace of God. Woe to Instagram, Facebook, and other wonderful social media sites. I love these sites as much as the next person. I dutifully post my cute family moments, victories, and smiles. Occasionally, I even post a picture of a sick child with a cute sad emoji to bring home the “reality” of it all…of course, while cuddling the sick child, preparing organic, homemade chicken noodle soup, and smiling at my husband as he enters a spotless home to sit down with a hot dinner. NOT. We currently home school. I run a business. I am in a marriage. I have three children. I’ve been told that I must have the patience of a saint. You should be a fly on the wall in my home. There are days that do feel effortless, and are filled with warm fuzzy feelings, but hey, there are plenty of days where I am counting down the hours until bedtime, while covertly peeking out the window to see if the school bus is passing by any time soon. This is my life. I love it, and I wouldn’t change it for anything, BUT it is not perfect. I am human, and so is every other mom out there. Don’t trust the Facebook window, because that’s all it is. A window. You don’t see the junk drawers, messy closets, dirty socks and unmade beds. You get a glimpse into a window that the other person allows you to briefly peer into. When an individual makes the choice to home school, work from home, work outside the home, have 10 children, raise their family on foreign soil, or fill in the blank, it does not necessarily mean that they are naturally patient, organized, gentle, calm, etc.. I can assure you that I do not have the patience of anyone who is known for their exceptional patience. Nope. Me? I have little to no patience on any given day, not counting the days that are extra hard, hormonal or tiring. By my own power, I am weak and impatient. I am short tempered and easily angered. That is Stephania. At the heart of who I am, I am naturally selfish and weak. BUT, thank the Lord that I do not always (yet sometimes I do..ugh) rely on my own power to get me through the day! It is by the grace of God, through the power of the Holy Spirit, in the name of Jesus, that I can portray any sort of character that might be viewed as patience. See Galatians 5 for a full list of the fruits of the Holy Spirit. I strive for those qualities, but friends, I am not perfect. If I were, I would have no need for the redeeming power of Jesus, and then my children would not be able to see my brokenness redeemed, day in and day out. They need to see that, because they are just as broken. 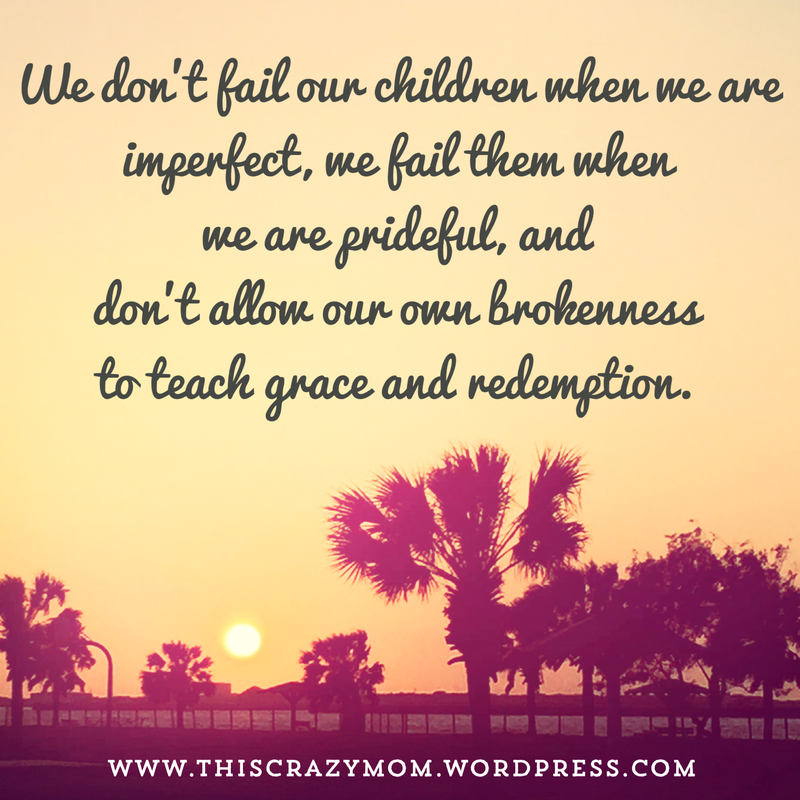 We don’t fail our children when we are imperfect, we fail them when we are prideful, and don’t allow our own brokenness to teach grace and redemption. Can we begin to strive for authenticity within our friendships and families? Can we open our windows a little wider and allow our imperfection to encourage other moms on the same path? Can we model grace for our children, by living it out and letting them peek into the messy, soul redeeming work that is ongoing in our lives? Believe me when I say… an authentic mom has far more reach than a perfect mom.